Where's Bernie Madoff when you need him. He ALWAYS had good..no, excellent ROI. Tax revenues decline with reduced population numbers. You didn’t expect the government to decline with them did you?? Japan’s Government Pension Investment Fund lost 9.1 percent, or 14.8 trillion yen ($136 billion), in the three months ended Dec. 31, it said in Tokyo on Friday. The decline in value and the rate of loss were the steepest based on comparable data back to April 2008. Domestic stocks were the fund’s worst performing investment, followed by foreign equities. Assets fell to 150.7 trillion yen at the end of December from a record 165.6 trillion yen in September. While stocks helped the GPIF generate returns for the previous two fiscal years, December’s global rout underscored the risks facing the fund since it revampedstrategy in 2014 to accumulate stocks and pare domestic bonds. The GPIF may have little choice but to invest in equities as fixed-income yields, especially those of Japanese government debt, are too low, said Naoki Fujiwara, chief fund manager at Shinkin Asset Management Co. in Tokyo. Unfunded pensions for state and local government employees are a growing crisis nationwide. According to the Pew Charitable Trusts, the 50 states have accumulated a total of $1.4 trillion in unfunded pension liabilities, or the gap between money in pension funds and the value of promises made to government workers, not including local pension funds. Only four states’ pension funds have at least 90 percent funding ratios, despite the fact that taxpayer contributions have doubled over the past decade. Many states are struggling with pension debt as a result of generous retirement benefits, unrealistic investment assumptions and a growing number of retirees living longer. However, Illinois’ pension crisis remains an outlier in its severity. 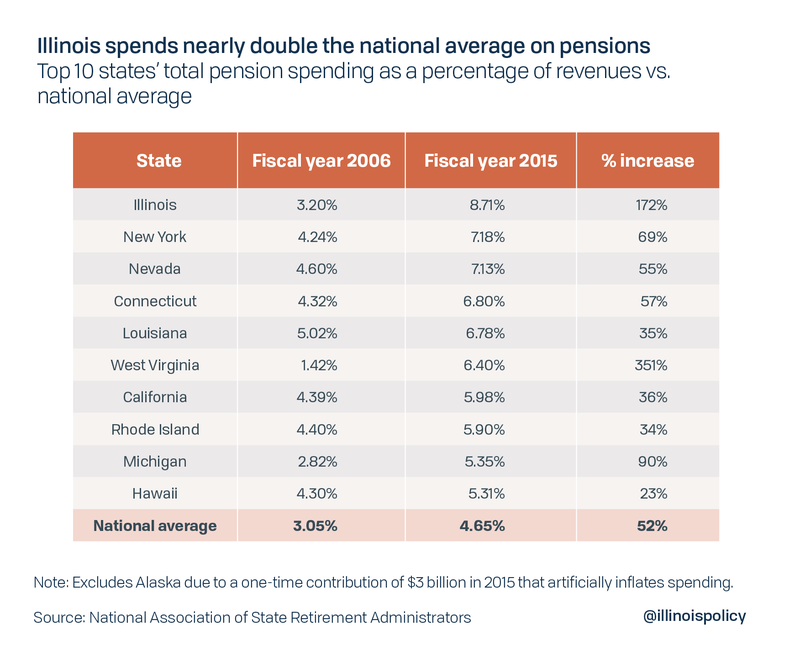 The most recent data from the National Association of State Retirement Administrators shows Illinois’ state and local governments spend the most in the nation on pension benefits as a percentage of all state and local revenue at 8.71 percent – nearly double the national average. Illinois and West Virginia also stand out as states where pension spending has grown rapidly from fiscal year 2005 to 2015. Total spending compared with total revenues is just one metric showing Illinois’ pension problem is the worst in the nation. Pension debt compared with revenues is another. Last year, Illinois set an all-time high record for state pension debt as a percentage of state revenues, at 601 percent. The state’s five systems have at least $133 billion in pension debt, which does not even include local pension debt. Pension-related expenditures now consume more than 25 percent of Illinois’ state budget, crowding out spending on social services, public safety and education. The south Chicago suburb of Harvey faced an intercept of state money owed to the city and had to lay off 18 firefighters and 13 police officers. Pursuant to a subsequent settlement agreement, the city will divert certain tax revenues to its police and fire pension funds. Chicago faced a more limited intercept of state money, and its pension contributions are set to spike by more than $1 billion over the next five years, despite several tax and fee hikes enacted by Mayor Rahm Emanuel to pay for pensions. The city of Peoria had to eliminate 27 municipal workers and 38 public safety positions to make pension payments. Currently, 85 percent of the city’s property tax levy goes to pensions, and that’s projected to rise to 100 percent in fiscal year 2020. Rockford was advised to cut police and fire services and privatize the city water system to make pension payments. Three smaller communities saw special property tax hikes to pay for pensions: Jerome, Geneseo and Norridge. 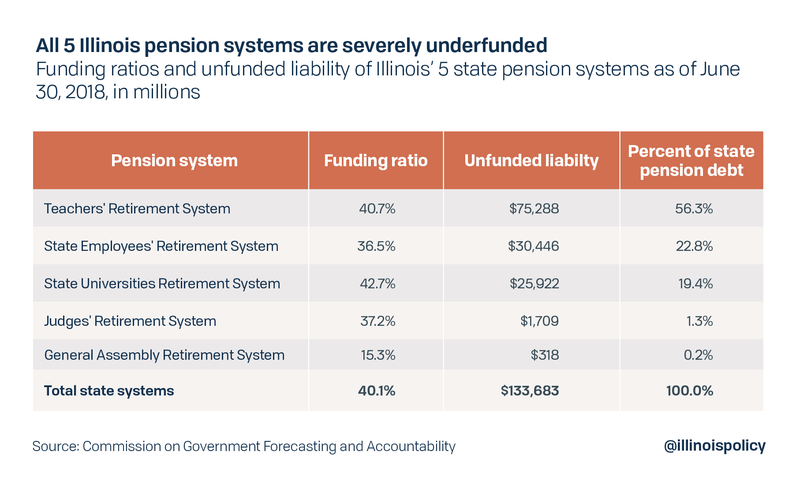 Despite the severity of Illinois’ pension crisis, commonsense solutions exist that would protect both government workers’ retirement security and taxpayers. By amending the state constitution to protect earned benefits, but allowing for changes in future benefit accruals, state lawmakers could pass a pension reform package that reduces annual pension contributions and fully funds the pension systems faster than planned under current law. This plan would enable state and local governments to honor promises made to both retirees and current workers – and would not cut a dime from their checks. A growing chorus of voices has endorsed a constitutional amendment to enable meaningful pension reform. This includes outgoing Chicago Mayor Rahm Emanuel and the Civic Federation, a Chicago-based research organization. Pension reform is necessary if lawmakers wish to protect those who will be most harmed by pension insolvency: government workers and retirees. Through meaningful reform, lawmakers would also protect taxpayers, stabilize state and local finances, and revive a state economy that for too long has been held back by tax hikes driven by pension costs. What the vast majority of these State Pension Plans ( NATIONWIDE) FAIL to tell is How the Legislators' Pension Plans pays in the least yet pulls out the most especially when one considers most legislators are actually Part-Time employees at the most yet get FULL retirements once they are out of politics/or 65. My suggestion is all State & County Pension Monies go into ONE pension pot/plan. It may only ease some of the financial pain for the tax payers at present but in the long run and with adjustments could become solvable. Poor planning by the bureaucrats and politicians cause the problem over DECADES. It has gone on for a long time and can still go on for a really long time. TPTB have the world focused on the issues that are irrelevant. The real ponzi scheme is actually a few layers beyond the things typically talked about, the ponzi schemes that are so worrisome in this thread have solutions on the shelf and ready to deploy, once enough pain has been doled out. TPTB can create as much wealth as they want to, at the click of a mouse. Even if the USD were to lose two-thirds it's value over the next dozen years, the system would survive without much issue, other than more reductions in the middle class. The ability to push local, state and global costs onto global workers is the design of the system and this ability isn't currently in jeopardy of going away. The original constitution would need to be resurrected to change the current system. The scheme will continue, the banksters are very well insulated. more reductions in the middle class. Much easier to control poor dumb ignorant people. Of course. Those in power know this and utilize it around the world. Most people on our planet must pay dearly if they want their children to get even a mediocre education. TPTB have their test case for the future already, look no further than N.K. They are not seriously concerned about any group of people right now. Their focus is on the last remaining possible threat to them - the armed, American worker. Somehow, someway they need to impoverish this group of people. For example, Take a look at recent policy and what has happened to many of the small farmers - nearly all of them are exactly inside this group. After spending more than three decades keeping order inside Philadelphia’s jails, Joseph Macy has two words to describe his career as a corrections officer: “Not fun.” He often worked double shifts, missing his kids’ school plays, baseball games, and other family occasions. More than once, he was stabbed and attacked by inmates. “I was away from my family and risked a lot to make it work, pay the bills,” said Macy, 60. In the last decade of his career, his base salary was in the $40,000 range, but he often more than doubled it with overtime pay. When he retired in 2017, Macy had accumulated so much overtime that he received a lump-sum pension bonus of $338,845 and started collecting an annual pension of $77,473 — $30,000 more than his final salary. Macy is far from an outlier. An Inquirer review of city pensions and payroll data found 17 other municipal employees — from water-treatment managers to social workers — who left their jobs in 2017 and achieved something that seems illogical: By retiring, they guaranteed themselves a bigger paycheck each month than the base salary they earned going to work day after day. In fact, the newspaper’s analysis shows that two-thirds of the 401 full-time municipal workers who started collecting a pension in 2017 had their retirement checks significantly boosted by overtime — on average 22 percent of their pensions are a direct result of overtime they logged in their final years. Together, it could add at least $17 million to the city’s pension obligations in the ensuing decades, according to the analysis. “When overtime for any one person constitutes 20 percent of annual compensation, it says something negative about either the budget or management system, let alone that being the average,” said Kenneth Kriz, director of the Institute for Illinois Public Finance at the University of Illinois at Springfield, and one of four experts who reviewed the Inquirer’s findings. City officials contend the cost estimates in the Inquirer’s analysis are inflated. They note that retiring employees have paid into their pensions and that offering overtime for current workers enables them to hire fewer staffers, saving money on salaries and benefits. They also point out that a hybrid pension plan instituted for new workers in 2016 establishes a $65,000 cap on the yearly income that can be applied toward their pension calculation, reducing long-term costs. The practice of allowing overtime to inflate retirement benefits is often called pension “spiking” — and it’s not a problem unique to Philadelphia. Many states and cities have tried to curb it in recent years. After the stock-market crash a decade ago sent state and local pension fund asset values plunging from $3.15 trillion to $2.17 trillion, several states moved to restrict or eliminate the use of overtime in pension calculations, according to a report published in December by the National Association of State Retirement Administrators. “It’s a problem everywhere,” said Pennsylvania Auditor General Eugene DePasquale, who has been critical of municipalities that let workers include overtime earnings in their pension calculations. He was an advocate of a state law passed last year that says some commonwealth employees hired after Jan. 1 can only apply overtime equal to 10 percent of their base salary in figuring their pensions. According to the Inquirer’s analysis, the overtime padding for Philadelphia retirees from 2017 is likely to cost the city’s already depleted pension fund $17.2 million more — or as much as $28 million, depending on stock-market returns — than if overtime had not been included in pension calculations. And that’s not counting the six-figure lump-sum pension bonuses many of those city workers were paid — and that were also inflated by overtime. For its review, the Inquirer enlisted actuary and pension expert David McCarthy at the University of Georgia to determine the long-term costs of overtime. It also then shared the results and sought feedback from other experts, including Kriz and the American Academy of Actuaries. The analysis applied to retirees among the city’s 18,000 blue-collar and white-collar union workers. It included some 2017 retirees who had jobs that did not qualify for overtime. It doesn’t include police and firefighters, who can earn overtime but whose labor contracts bar them from including it in pension calculations. The Inquirer asked for the records after it learned last year that Joy Hurtt, a youth detention counselor whose base salary is $49,551, is in line for a $387,055 pension bonus payment and an annual pension of nearly $90,000 when she retires in 2021. Both numbers spiked because of the overtime Hurtt claimed, often doubling her salary. Hurtt and the 2017 retirees are representative of a decades-old system designed to maximize city employees’ retirement benefits. Their annual pensions are calculated using a worker’s years of service and the average income collected during his or her three highest pay years, including overtime pay. Union contracts require that overtime pay opportunities — typically 1.5 or two times the equivalent hourly wage — go first to volunteers by seniority, which helps workers closer to retirement pad their pensions. Overtime pay also counts toward the Deferred Retirement Option Program (DROP), which allows employees to set a retirement date and accumulate a pension in an interest-bearing account — while also collecting a salary and any extra pay — for up to four years and then retire with the lump sum. Retirees’ pensions are funded through a combination of contributions from employees, city and state taxpayers. They also include returns from the city’s pension funds investment — now projected to be 7.65 percent a year. If the fund’s investments don’t perform at that level, the costs rise. If the pension fund were fully funded, the employee’s contributions — which range between 3 percent and 7 percent of their pay depending on their pension plan — would account for 40 percent of the city’s annual deposits to the fund. But the fund has such a huge deficit that taxpayers have to make up for the shortfall, contributing about 10 times what employees pay. City officials say steps, such as the new $65,000 income cap and increased contributions from employees and the sales tax, have put the pension plan on track to be fully funded by 2033. “One of the highest priorities we had in the last collective bargaining was to help the health of the pension fund, and I think by limiting the defined benefit portion, we’ve done that,” said finance director Rob Dubow. For example, had Macy, the corrections officer, had the same work history under the city’s new plan, his annual pension would be about $46,800, or nearly $30,000 less than it is. If Macy’s pension were calculated under a 10 percent cap rule similar to what the auditor has backed, it would be about $32,800, less than half what he is getting. If 2017 was a typical year — with overtime contributing to 14 percent of all municipal employees’ final average salary — then about $949 million of the $6.78 billion owed to present and future municipal retirees would be attributable to overtime, the Inquirer determined. Currently, the fund has less than half the money it needs to fulfill those pension promises, plus that of elected officials, police and firefighters, all of which total $12 billion. Still, he warned that it’s not a cost the city could simply eliminate. Because these are bargained benefits, he said, it would likely have to be replaced by higher salaries, tuition benefits, or other perks. Most of the experts interviewed by the Inquirer said that while overtime does add costs to the pension fund, it is only part of the problem. “When you have a $6 billion unfunded liability, you need to look at every cost. … [Overtime] is a cost and all of the cost drivers should be put on the table and discussed,” said City Controller Rebecca Rhynhart, who has raised concerns about the health of the city’s pension fund. City officials say it’s a balancing act to decide when to pay overtime and when to hire new employees. Since Mayor Jim Kenney took office in 2016, the city has added nearly 1,000 workers. Overtime has also steadily increased each of those years. City spokesperson Mike Dunn said factors beyond staffing contribute to the need to pay overtime, such as equipment issues, bad weather, or special events. He also noted that the city’s fiscal watchdog, the Pennsylvania Intergovernmental Cooperation Authority, said in its most recent quarterly report that the city is on track to spend less in overtime this fiscal year than it did the previous year, despite an increase in wages for employees, which drives up hourly overtime rates. The 2017 retirees interviewed for this story said that they couldn't have supported their families on their base salaries. Overtime helped them make ends meet. Picano, 61, also received a $292,775 DROP retirement payment. He said he used the money to remodel his home, a South Philadelphia house his mother purchased in the early 1970s. Meighan, 58, of Grays Ferry, received an $80,000 DROP payment when he retired, but still criticized the program as a detriment to taxpayers and efficient services. Macy, the corrections officer, retired to Marlton. He said that officers in that job barely last; turnover is constant. He said often he was forced to work the overtime because they simply didn’t have enough staff to cover shifts. “I feel like I earned every penny. I’ve been through a lot in those jails,” Macy said. Staff writers Jonathan Lai and Dylan Purcell contributed to the data analysis. A previous online version of this story incorrectly said that city employee overtime also affected Pension Adjustment Fund payments. The Inquirer merged pension records of the 2017 retirees with a decade worth of payroll data that broke out salary, overtime pay, and total compensation. We excluded police and firefighters, who can’t include overtime in pension calculations; part-time workers; and employees of the quasi-government agencies who also get city pensions. Pension expert David McCarthy at the University of Georgia used the city’s investment discount rate and life-expectancy formulas to devise an annuity factor applicable to every retiree. That factor helps identify the estimated long-term cost of overtime in each retiree’s pension. Our analysis used pension distributions after deductions, which can include taxes and court-ordered spousal support. It also is based on calendar-year payroll data; employees can opt instead to use their retirement date to determine a calendar year for the purpose of a pension calculation. The latter could cause overtime costs to be slightly higher than what our analysis showed. Dat's Philly's Local Progressive Leftists problem. Let them deal with it. The "city prisoner" Voters will keep voting them in until they have an East Coast Detroit circa 1995. RICHMOND, Va. (AP) — Virginia’s pension fund is in a worse position to handle a market meltdown than it was before the Great Recession more than a decade ago, according to a recent state report. That’s despite a 10-year bull market and pension reform efforts by lawmakers to make the fund more resilient. The Virginia Retirement System’s recent “stress test” predicts that a market crash or several years of lower-than-expected returns would add billions to the plan’s current unfunded liabilities. Such hits would leave lawmakers with limited and painful options, like slashing services or raising taxes to meet required contribution levels or underfunding the pension plan and leaving higher costs for future generations to pay off. The Virginia Retirement System is one of the biggest in the country and serves about 705,000 current and retired state employees, public school teachers and certain city and county public sector workers. Contributions from the state, these agencies and their employees fund one-third of the pension fund while investment returns make up the rest. A fiscally conservative state without strong public sector unions, Virginia has avoided pension crises that have hit states like Illinois, New Jersey and Kentucky. Lawmakers in those states have responded to massive unfunded liabilities by proposing tax hikes or limiting pension benefits. But Virginia lawmakers skimped on contributing to the pension fund for decades, paying only a portion of the yearly amount that actuaries said was needed. And losses from the Great Recession, which saw the fund lose 21 percent of its value in 2009, have also helped put the fund’s health at risk. —If financial markets were to repeat what happened during the Great Recession, the unfunded liability for the state-employee plan more than double and hit $12.5 billion. —If the pension fund were to see five years of 5 percent returns instead of the projected 7 percent, the state plan’s unfunded liability would increase $2.2 billion. —If the pension fund were to see 10 years of 5 percent returns instead of the projected 7 percent, the state plan’s unfunded liability would increase $4.2 billion. The report also found that pension systems in North Carolina and Wisconsin are more likely to weather downturns because those states have been more fiscally disciplined. Jim Regimbal, an economist who advises Virginia counties and cities, said he’s thinks a prolonged period of lower-than-projected returns is more likely than a market shock like the Great Recession. And he said local governments, which pay a higher share of teacher pension costs than the state, would be severely squeezed trying to make required contributions. “It would rob money from every other program out there,” he said. Patricia Bishop, director of the Virginia Retirement System, said her agency has tried to mitigate risk through a diverse portfolio of private equity, real estate and other assets that aren’t tied to a potential stock market drop. But she acknowledged there’s only so much the fund can do to avoid a downturn. “There’s no magic pill,” she said. She added that the fund has already reduced the cost of future benefits through a “hybrid” retirement plan that melds traditional defined benefits with a defined contribution plan like a 401(k), which employees direct and which can gain or lose value based on market fluctuations. The fund’s most recent quarterly report, for the last three months of last year, shows how the fund is tied to market swings. The fund reported losing $4.4 billion between October and December when the stock market suffered big losses. The stock market’s bounced back this year, but the fund has not yet reported its latest earnings. Overall, the fund was down 1.3 percent in 2018. State lawmakers have spent recent years trying to fix pension problems. They created the hybrid system, made one-time payments aimed to reducing the fund’s unfunded liabilities, and committed themselves to fully funding yearly contribution requirements going forward. 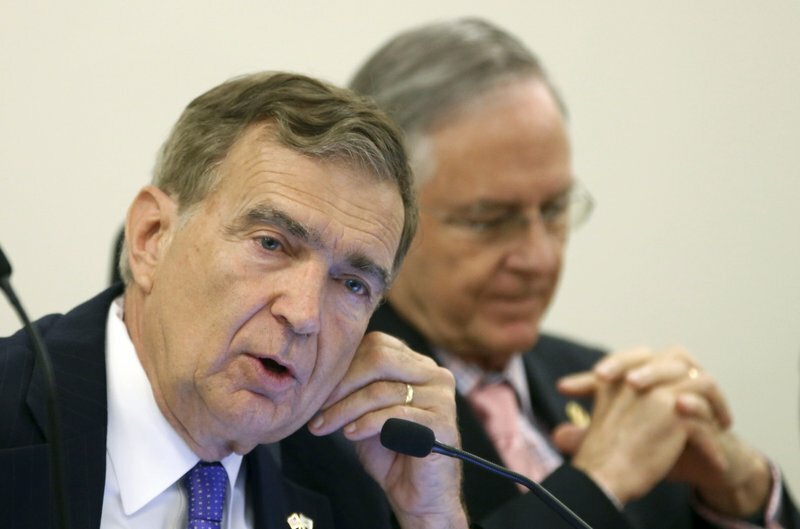 Republican Sen. Emmett Hanger, a co-chair of the Senate Finance Committee, said the worst-case scenarios described in the stress test are “scary,” but he believes the fund is in a relatively “comfortable position” because the General Assembly is more disciplined in pension funding and overall budgeting than in years past. He said top lawmakers who write the budget are committed to fully funding the pension from now on and have no appetite for using it as a “piggy bank” like in years past. “We’re on a good trajectory,” Hanger said. If a Market Melt Down hits it will be more than Virginia and it's Pension Funds. Might as well add the other 49 states. IDK of any state in a positive cash flow position. Please feel free to correct where I'm wrong.